Menopause is defined as the time of cessation of ovarian function resulting in permanent amenorrhea. According to the World Health Organization, 12 months of amenorrhea confirm that menopause has set in. In 1990, about 25 million women worldwide reached menopause, and this number is expected to double by 2020s. Menopause is a critical issue and is associated with the end of the fertile period of a women's life. Menopause is an important subject to study as due to increase in life expectancy and improved health-care delivery number of postmenopausal women is significantly increasing. Menopause presents with symptoms such as vasomotor, somatic symptoms, psychological symptoms, and sexual dysfunction, which may have a significant impact on quality of life of postmenopausal women. Some women may feel that the purpose of life has lost as they enter the menopause due to loss of fertility. Psychological symptoms commonly observed among postmenopausal women are depression, irritability, anxiety, and mood changes. In a study done by Vijayalakshmi et al., in Amritsar involving 30 rural women 40–55 years of age, depression was one of the common prevalent symptom (37.3%). The tool used in this study was ZEG Berlin menopause rating scale to assess the menopausal transition. In a study conducted by Timur and Sahin, the prevalence of depression symptoms among the peri- and post-menopausal women was 41.8%. Of all women, 23.2% were premenopausal and 56.9% were postmenopausal. In a study conducted by Singh and Pradhan in New Delhi, 32.1% of postmenopausal women suffered from depression. Thus, it is important to study the prevalence and influencing factors of depression in postmenopausal women to improve their quality of life. The objective of the study is to determine the prevalence of depression and its association with sociodemographic factors in postmenopausal women in an urban resettlement colony of Delhi. The study was conducted among postmenopausal women who were resident of Gokulpuri. Gokulpuri is an urban resettlement colony in North-East Delhi. A total of 580 postmenopausal women were included in the study by house-to-house survey. The sample size was calculated based on a study conducted by Timur and Sahin in which prevalence of depression among women was 41.8%, with 10% allowable error the sample size was 552. Considering 5% nonresponse, the final sample size was 580. The systematic random sampling method was used to select study individuals. Postmenopausal women with amenorrhea from 1 year were included in the study. Women with severe illness, mentally challenged, and women with surgical menopause were excluded from the study. A predesigned, pretested, semi-structured interview schedule was used to collect information from study participants regarding sociodemographic details, personal history, and postmenopausal symptoms. Hamilton depression (HAM-D) scale was used to find out the prevalence of depression. Since its development in 1960 by Dr. Max Hamilton of the University of Leeds, England, the scale has been widely used in various studies. Although the HAM-D form lists 21 items, the scoring is based on the first 17. It generally takes 15–20 min to complete the interview and score the results. Eight items are scored on a 5-point scale, ranging from 0 = not present to 4 = severe. Nine are scored from 0 to 2. Sum the scores from the first 17 items. ≥23 = Very severe depression. Ethical clearance for the study was obtained from Ethical Committee of Maulana Azad Medical College. Informed written consent was taken from each subject before the interview. No pressure was exerted on study participants to participate in a study. Confidentiality was ensured at all stages. The collected data were entered into MS-Excel and analyzed using SPSS version 22 (Chicago, IL, USA). The Chi-square test was used to compare qualitative variables and proportions, with the level of statistical significance set up at P < 0.05. 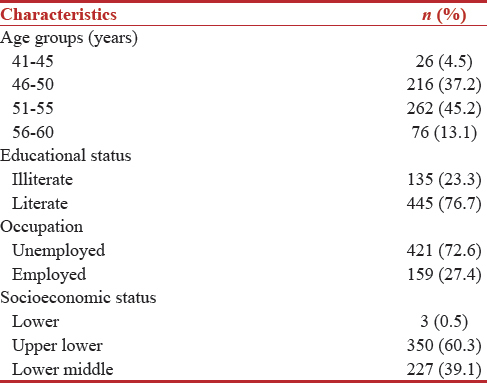 [Table 1] shows the distribution of study participants according to sociodemographic factors. About 45.2% women were in the age group of 51–55 years, 37.2% belonged to the age group of 46–50 years, 13.1% were in age group of 56–60 years, and only 4.5% in age group of 41–45 years. About 23.3% women were illiterate, 86.9% women were married, 2.2 were divorced, and 10.9% were widow. 86.2% were belonging to joint family and 13.8 to nuclear family. 60.3% women were of upper lower class, 39.1% of lower middle class, and 0.5% of lower class. [Table 2] shows distributions of study participants according to grades of depression as per HAM-D Scale. About 58.4% women were normal with no depression, 38.3% were in mild depression, and 3.3% women were having moderate depression. [Table 3] shows various factors influencing the prevalence of depression in postmenopausal women. In the age group of 41–45 years, 76.9% women had mild depression and 19.2% were with moderate depression. In the age group of 46–50 years, 60.6% had mild depression and 4.2% were with moderate depression. These data show that depression was more in young postmenopausal women as compared to that in older age groups and the difference was found to be statistically significant. The depression was more in women belonging to lower and upper lower socioeconomic status as compared to lower middle group with statistically significant difference. 53.8% divorced women and 87.3% widows had moderate depression. Data show that married women were less depressed than divorced and widow (“P” < 0.05). In the present study, the prevalence of depression was more in illiterate women as compared to literate (P < 0.05). A total of 580 postmenopausal women were interviewed maximum women were in the age group of 51–55 years. As per HAM-D Scale, 58.4% women were normal with no depression, 38.3% were in mild depression, and 3.3% women were having moderate depression. In a study conducted by Polisseni et al. in Brazil, the prevalence of depression during menopause was 36.8% which is similar to our study. In a study conducted in Iran by Afshari et al. prevalence of depression in postmenopausal women was found to be 59.8% where 39.8% women had mild depression and 16% had moderate depression which is higher than the present study. Depression was found to be present more in women belonging to the younger age group. In the age group of 41–45 years, 76.9% women had mild depression and 19.2% were with moderate depression. In the age group of 46–50 years, 60.6% had mild depression and 4.2% were with moderate depression, whereas in the age group of 51–55 years, 21.8% and 1.9% women had mild and moderate depression respectively and in the age group of 56–60 years 18.4% had mild depression and none presented with moderate depression. Data clearly show young postmenopausal women were more in depression which is similar to a study by Unsal et al., in Turkey, in which depression was more in women who entered the menopause at early age (<39 years). In the present study, the prevalence of depression was more in women of lower socioeconomic status as compared to the women who were belonging to higher socioeconomic status, which is consistent with a study conducted in Beijing city by Li et al., where the association was found between depression in postmenopausal women and socioeconomic status. In our study, married women who had good relations with their husband were happier and depression was present more in women who were divorced, and widow and the difference was found to be statistically significant (P < 0.05). A study conducted by Bansal et al., in Punjab showed similar findings, women who were widow were more severely depressed as compared to married women. Similar findings were seen in a study conducted in Beijing city by Li et al., where depression was more prevalent in women who were divorced or separated. In the present study, the prevalence of depression was found to be more in illiterate women. Among illiterate women 57.8% were with mild depression and 5.2% with moderate depression whereas in literate women only 32.4% were with mild depression and 2.7% were with moderate depression and difference was found to be statistically significant (P < 0.05). Similar findings were seen in a study conducted by Afshari et al., in which education level was found to be associated with the prevalence of depression in postmenopausal women. Furthermore, in a study conducted by Choi et al., in Korean women results confirmed that the important variables in the prediction of menopausal depression are educational and economic status. This study shows the prevalence of depression in a significant number (41.6%) of postmenopausal women. Depression in postmenopausal women was associated with various factors such as age, education, socioeconomic status, and marital status. Depression can lead to disability and affect interpersonal relations, career and social functions which can cost a high amount to health-care system. Thus, the diagnosis of depression and relevant influencing factors in postmenopausal women is important. The comprehensive intervention programs can be developed for decreasing depression in postmenopausal women considering all these influencing variables. I would like to express my heartiest gratitude to my husband Dr. Ajay Kumar for giving me moral support and encouragement. Howkins J, Bourne G. Perimenopause, menopause, premature menopause and postmenopausal bleeding. In: Paduvidri VG, Daftary SN, editors. Shaw's Textbook of Gynaecology. 14th ed. India: Elsevier; 2008. p. 37. World Health Organization. Research on Menopause: Report of WHO Scientific Group. Technical Report Series 670. Geneva: World Health Organization; 1981. Vijayalakshmi S, Chandrababu R, Victoria E. Menopausal transition among Northern Indian women. Nitte Univ J Health Sci 2013;3:73-9. Timur S, Sahin NH. The prevalence of depression symptoms and influencing factors among perimenopausal and postmenopausal women. Menopause 2010;17:545-51. Singh A, Pradhan SK. Menopausal symptoms of postmenopausal women in a rural community of Delhi, India: A cross-sectional study. J Midlife Health 2014;5:62-7. Polisseni AF, de Araújo DA, Polisseni F, Mourão Junior CA, Polisseni J, Fernandes ES, et al. Depression and anxiety in menopausal women: Associated factors. Rev Bras Ginecol Obstet 2009;31:28-34. Afshari P, Manochehri S, Tadayon M, Kianfar M, Haghighizade M. Prevalence of depression in postmenopausal women, Jundishapur. J Chronic Dis Care 2015;4:e27521. Unsal A, Tozun M, Ayranci U. Prevalence of depression among postmenopausal women and related characteristics. Climacteric 2011;14:244-51. Li Y, Yu Q, Ma L, Sun Z, Yang X. Prevalence of depression and anxiety symptoms and their influence factors during menopausal transition and postmenopause in Beijing city. Maturitas 2008;61:238-42. Bansal P, Chaudhary A, Soni RK, Sharma S, Gupta VK, Kaushal P, et al. Depression and anxiety among middle-aged women: A community-based study. J Family Med Prim Care 2015;4:576-81. Choi H, Lee D, Lee K, Kim H, Ham E. A structural model of menopausal depression in Korean women. Arch Psychiatr Nurs 2004;18:235-42.